Mauro Domine sponsors his daughter, Keira Domine, 11, and her friend, Laura Ronquillo, 11, during the Rite of Election ceremony March 10 at St. Mary Cathedral. Archbishop Thomas Wenski admitted 494 catechumens as members of the elect as they prepare to receive the sacraments of initiation into the Catholic Church at the Easter Vigil. The Rite of Election ceremony took place the Sunday after Ash Wednesday, March 10, at St. Mary Cathedral in Miami. 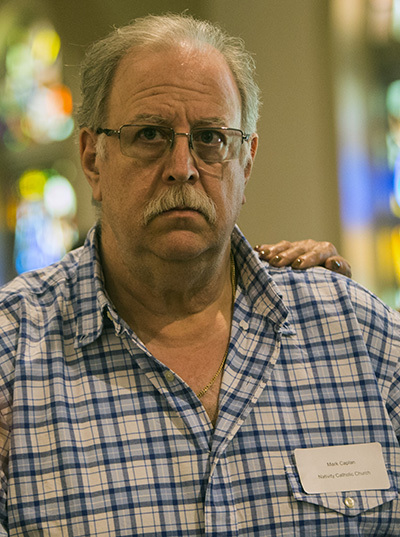 Mark Caplan, 60, a catechumen from Nativity Church in Hollywood, stands as his sponsor places her hand on his shoulder and affirms his commitment to join the Catholic faith. The cross bearing the star of David medal which Mark Caplan wears around his neck. 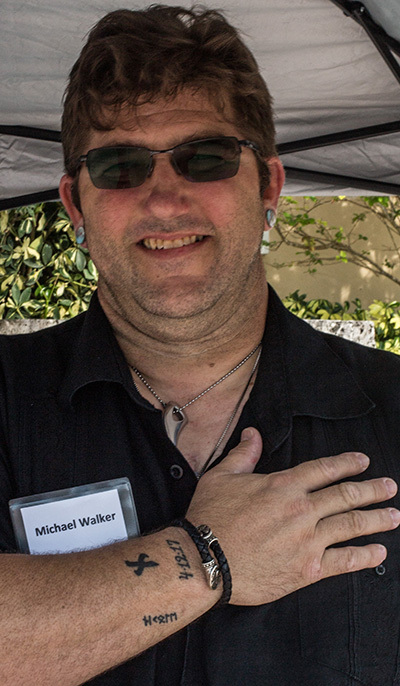 Michael Walker, a catechumen who almost died in 2017, displays a tattoo with the date of his near-death experience, 4-12-17. 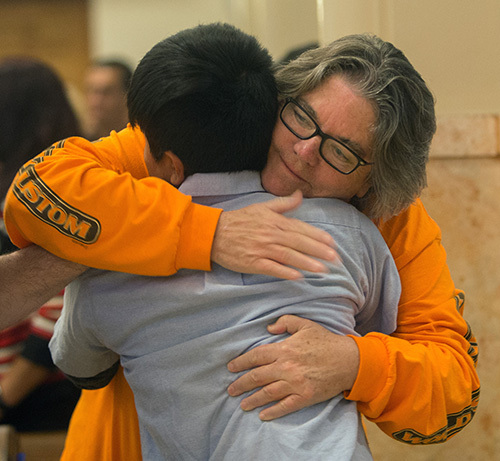 Rose Anderson, sponsor, hugs Juan Tito Benito, 12, a Guatemalan who came to the U.S. as an unaccompanied minor in 2017. 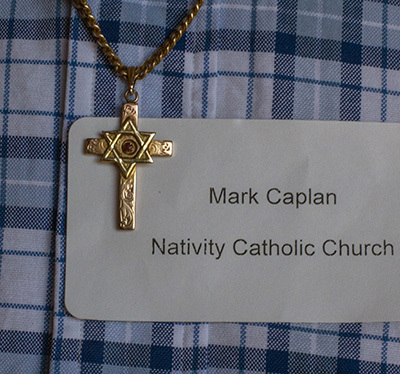 MIAMI | As a sign of his solidarity with the Catholic and Jewish faiths, Mark Caplan, 60, wears a silver cross around his neck that bears a Star of David on top of it. 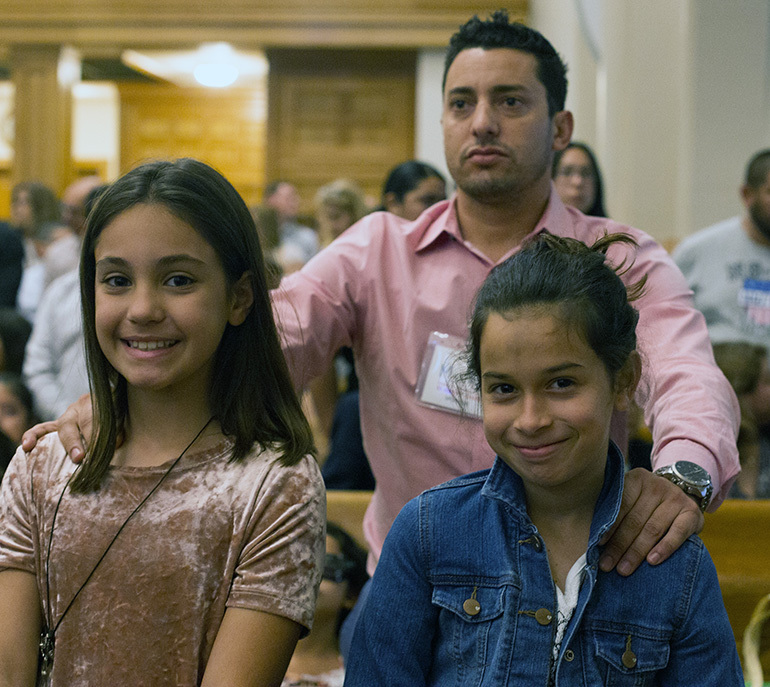 “I was raised Jewish, bar mitzvahed when I was 13 years old and attended temple as a young man,” said the catechumen from Nativity Church in Hollywood, one of 494 who attended two Rite of Election ceremonies at St. Mary Cathedral March 10. Catechumens are people who have not been baptized but have decided to join the Church. They have been learning about the Catholic faith through the RCIA (Rite of Christian Initiation of Adults) and will receive the sacraments of initiation — baptism, Communion and confirmation — at the Easter Vigil. The catechumens this year came from 68 parishes throughout the archdiocese. Most were children, but there were also adults. Caplan met his future wife, Marisol, in 1986 at Hollywood Beach. Mark wanted to take Marisol to a better restaurant, but he made her call her mother to make sure it was okay. Marisol’s mother said, “Come home.” He called again to make another date and they struck up a relationship. Mark and Marisol were married July 4, 1987 at St. Stephen Church in Miramar. Mark goes to church with his wife and said they never had a problem with religious differences. But some of Mark’s clients in the window- door- and shutter-manufacturing business did object when they saw his cross and star of David. They asked him why he wanted to convert. Mark is retired now and says he wants to be closer to God. The couple have two children, Mark, Jr., 30, and Clarissa, 29, who were raised Catholic. Michael Walker, 46, from St. Lawrence Church in North Miami Beach, said he finally decided to take the step and commit to the Catholic faith after he nearly died in 2017. Walker had been going to church with his wife and children but never fully committed. He wanted to surprise his wife. Walker said that what doesn’t destroy you makes you stronger. He has the date of his close encounter with death tattooed on his lower right arm, 4-27-17. During the Rite of Election, Archbishop Thomas Wenski asked the sponsors, or godparents, if the catechumens had listened faithfully to God’s word as proclaimed by the Church, responded to that word, and begun to walk in God’s presence; and if they had shared the company of their Christian brothers and sisters and joined with them in prayer. He then asked the catechumens if they wished to enter fully into the sacraments of the Catholic Church. After answering in the affirmative, the catechumens came forward with their godparents and signed the Book of the Elect. They will spend Lent in an intense period of preparation before their initiation into the Catholic Church, which will take place during the Easter Vigil at their respective parishes. 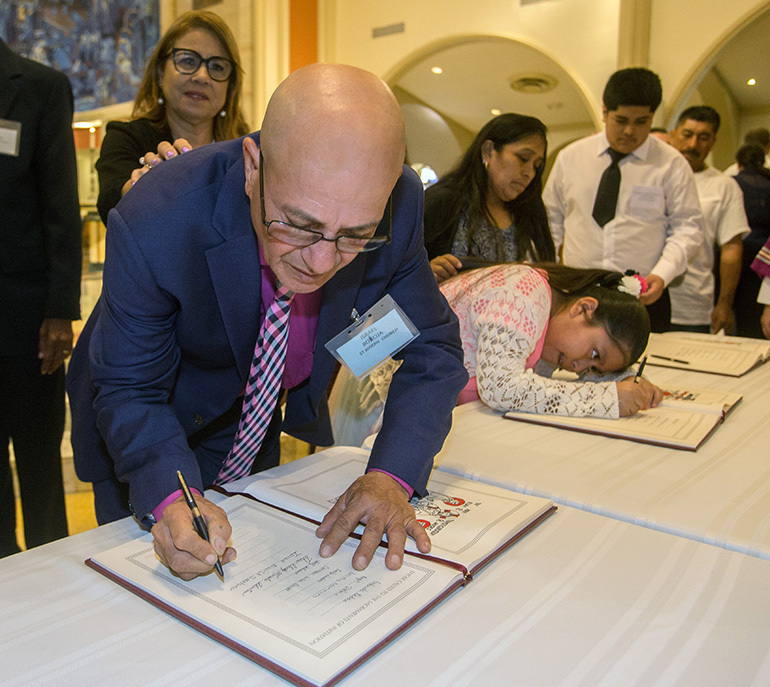 Israel Boicija, from St. Joseph Church, Miami Beach, signs the Book of the Elect as his sponsor, Carrie Parrilla, stands behind him.